Conceptual rendering by HDR, Inc. for The Trust for Public LandPhoto credit: HDR, Inc. In 2002, a torrential flood descended on Atlanta's historic Vine City and English Avenue communities. In its aftermath, 160 families lost their homes. While the city worked to relocate those impacted by the flood, the land where they once lived lay vacant. Flooding, pollution, and sewer overflows have continued to plague residents. 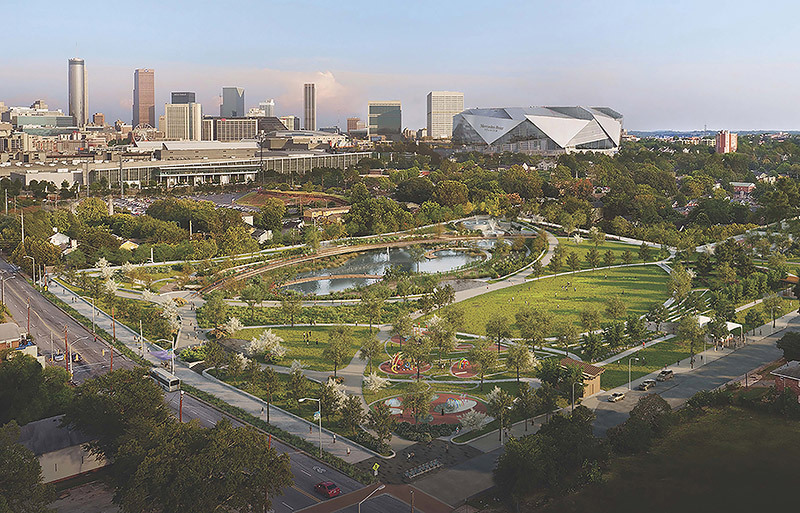 In 2015, The Trust for Public Land began working with the City of Atlanta to build the new 16-acre Cook Park on the site where those homes once stood. A 1.5-acre pond within the park will be able to store up to 10 million gallons of stormwater during a 100-year storm event, alleviating flooding in 150 acres of residential neighborhood surrounding the park and reducing flood risk further downstream. Cook Park will feature a playground, splashpad, great lawn, and public performance space. Through the National Monuments Foundation, the park will feature statues highlighting the contributions of community residents to the civil rights movement; Dr. Martin Luther King Jr. and other leaders of the movement once lived just blocks away. Construction of the park began in late 2017, and we expect it to be open in early 2019.